Outdoor gutters fade in time. While vinyl gutters do not require painting, aluminum and steel gutters benefit from a fresh coat of paint. 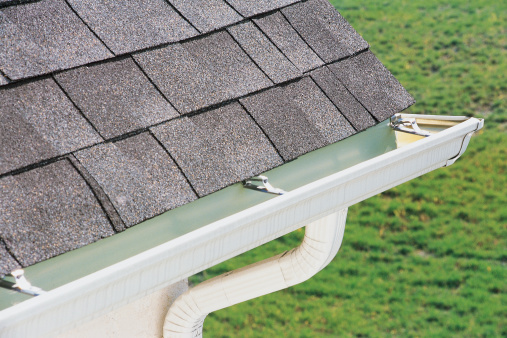 Rust-Oleum is a common choice for painting existing gutters, protecting them from the elements. Repainting outdoor gutters with Rust-Oleum requires some preparation ensuring the paint adheres well to the gutters and offering long-lasting beauty and protection. Position a stepladder under the gutters. Scrape off any flaking paint with a plastic putty knife. The plastic putty knife does not scratch aluminum like a metal putty knife or steel wire brush. Move the stepladder as necessary and continue scraping the old, loose paint from the entire gutter system. Fill a bucket with water and 2 tablespoons liquid dish soap. Scrub the outside of the gutters with a horsehair scrub brush dipped in the dish-soap solution. This removes the film of dirt and grime. Rinse the gutters thoroughly with a garden hose. Allow the gutters to dry thoroughly. Cut a 4-foot long, 2-foot wide piece of cardboard from an old box with a utility knife. Shake the can of Rust-Oleum vigorously until the ball inside the can doesn't clink loudly. Place the cardboard under the gutter between the gutter and the house. This prevents overspray. Spray Rust-Oleum onto the gutter in an even pattern. Spray several thin layers of paint rather than one thick layer. Continue moving along the gutter system's length, moving the cardboard between the house and gutter as you paint.